I worked over the course of three sessions to lay down the watercolors on this one. First day puts down the basics, but not too much. The next session, I put down the majority of the color and stopped before overdoing it. The last session was short, adding depth and shading. I added a bit more ink to the flowers and a few spots of brickwork that I forgot. I like the change to the slate shingles. The flat orangey asphalt ones didn’t do much for me and the slate gives the house a more stately look. I’ll let it sit for a few days but I think it is about done. I need to have a few more complete watercolor home portraits to add a listing to my etsy shop in addition to the pastels portraits. 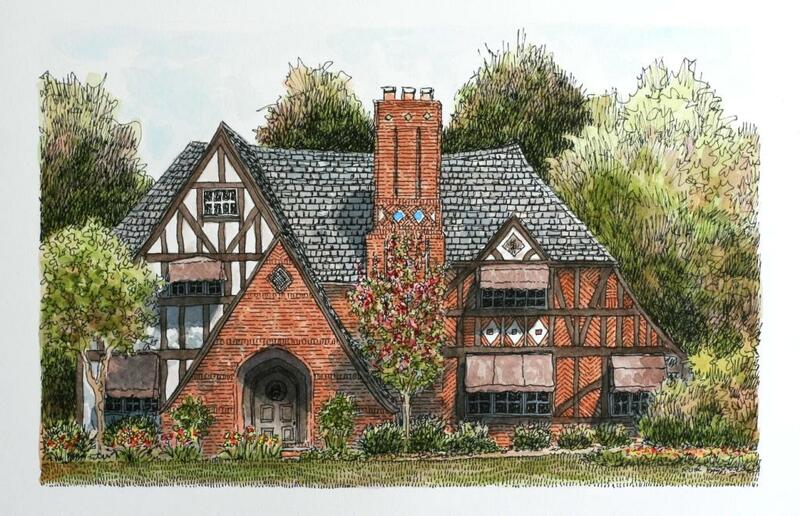 So next up, I think I will redo my own house with the watercolors. I never liked the way it turned out when I did it with the pastels, so maybe I will with the watercolors. It’s not quite so grand as this one, but we like it. I inked up the little drawing and I think it turned out pretty well. 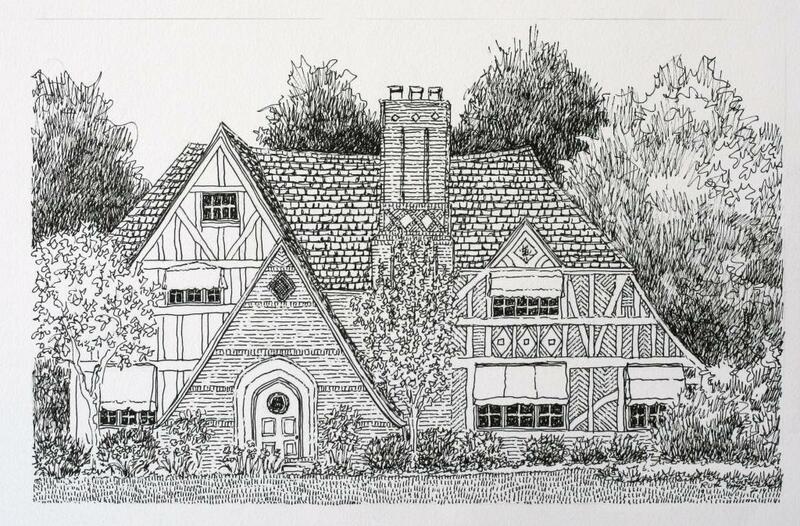 I wasn’t sure how much detail I would be able to show because the picture is only 10 x 7 which is small for such a large house. Still, it’s good to experiment, just in case I would get a contract for something similar. The brickwork was interesting and therefore complicated. There were lots of diagonals inside the timber work and a pretty elaborate pattern on the fireplace flue. The roof has some interesting curves too. The edges of the main gable are quite upturned. The lower eaves also have a gentle upswing. All in all, with the steep pitch of the roof line, it is quite an elegant house. The only thing I really changed was the shingles. They were just plain, flat asphalt shingles, not even dimensional ones, so I made them into slate. Artist’s privilege and the house deserves better. I am going to use the watercolors here. I am thinking of putting that in as an option for my home portrait commission work so I do need some samples. No berry picking today. We got 2.6″ of rain over night and everything is wet, wet, wet. As you might have guessed by my absence, blackberry season has started. Along with the continual garden weeding, I have been spending a lot of time outside. In any case, I have been undecided for a while on what to do next. There have been plenty of distractions lately, but I did need to pick something. I went through my photos and nothing quite jumped out at me. I did want another architectural so I looked again and chose this one. At first I wanted to crop to the entryway area, but I couldn’t find a good view, no matter what I tried. So instead I am drawing the whole thing. I still kept it small – about 10″x6″. I will probably color it with the watercolors just for practice. 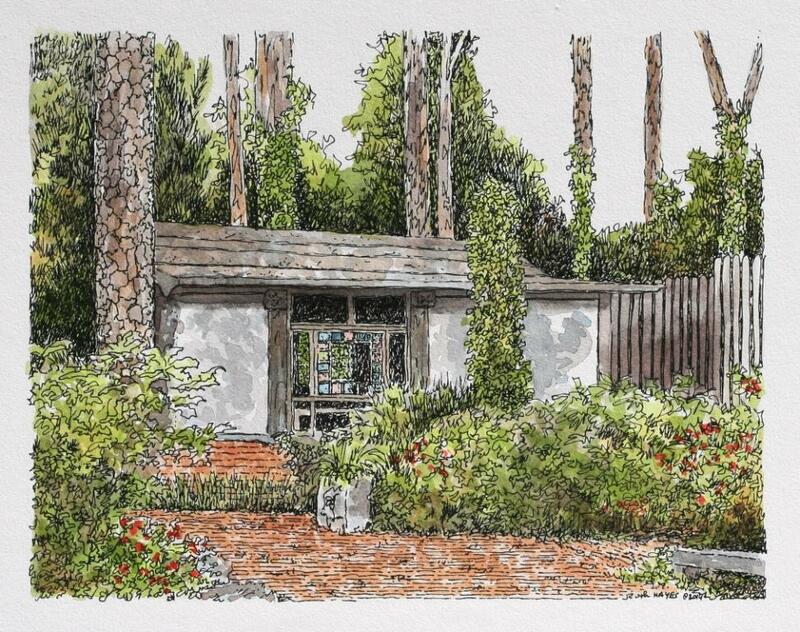 It will be interesting to see how such a large house turns out in such a small drawing. I had a great surprise in the mail on Friday. Remember I had entered 2 paintings in a gallery show a few weeks ago? Well, according to their show prospectus, notifications would be sent out the end of this week. Lo and behold, I got the letter that both were accepted a week early. Now I have to mat and frame them up. Not a huge deal because I can cut the mats myself, but they want them framed under plexiglass and I don’t know where I will get that. The good thing is I have over a month to figure it out. 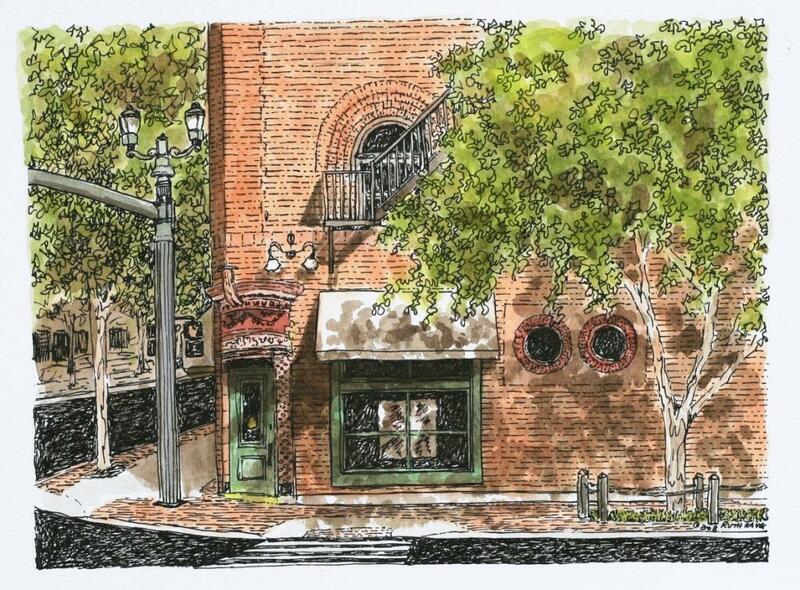 I plan to hand deliver the two and make a day of it to take some more small town architectural photos. It has been a long time since I did that – well before I got my digital camera in 2005. That should prove fun too. I think of the two, I like the artist’s studio better. The works will be for sale with a commission to the gallery, but what the heck. I think the exposure will be good and if I can get some additional architectural commissions out of it, so much the better. Selling them would be a bonus. Last Sunday, after a long day of trying to relieve my finger pain from the bee sting, I found what might have been a stinger when I took out my contacts. Once I took it out, the pain rapidly subsided and by morning all was fine. I just wish I had found it earlier. I can’t really see close up with the contacts in and nothing very well past three inches beyond my nose with them out. 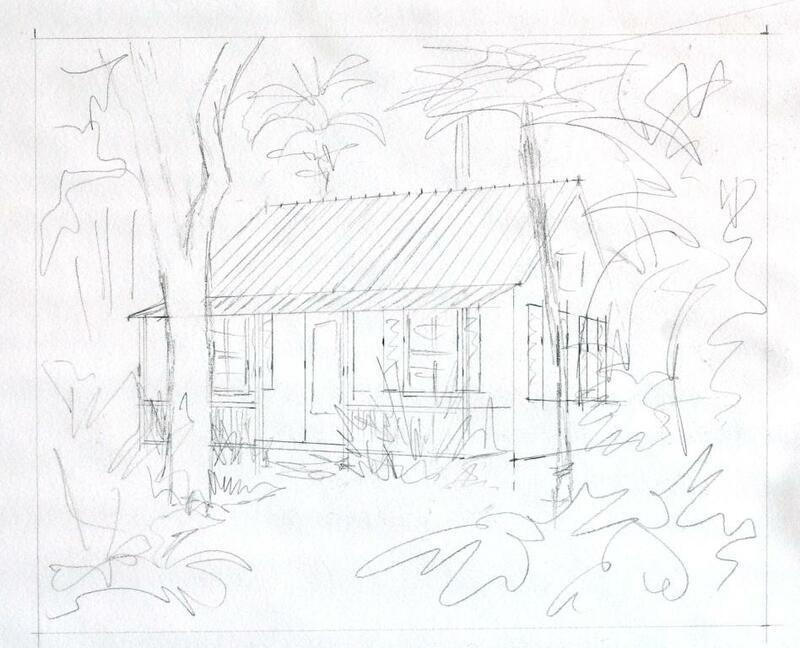 But all’s well now and it’s back to the drafting table. I wanted to make this little cottage a peachy color with green shutters, unlike the bland white siding and black shutters in the photo. I am not quite sure I got the peachy color quite right, but overall I am pleased with it. It looks quite nice, nestled in the trees. It would make a great hideaway for someone, don’t you think. I’ll let it sit for a day or two, then make a few final adjustments. I think mostly it will involve some deepening if color and the shadows. It’s been a tough day for my hands. The ceramic soap dish in my bathroom broke and I sliced my left thumb pad first thing this morning. Then I went out to pick raspberries for probably the last time this summer and managed to get stung on my right pinkie by a ground bee just before I was finished. Man, did that ever hurt. I got back to the house and put a baking soda paste on it which helped for about half an hour. Then it started throbbing badly again so I tried a baking soda/vinegar soak for a while. A little bit of relief. Then it started to hurt again and swell up as well and move some into my ring finger. I haven’t had something hurt like that in ages. On to some benadryl spray, ibuprofen, and icing it. The off and on icing has helped the most, but 6 hours later I can still feel it. It is still swollen a little and stiff. I guess I will be continuing the icing the rest of the day. Durn ground bees. I think this is the first time I have ever been stung in all the years of berry picking. All of the weeding hasn’t helped the nerves in my hands either. 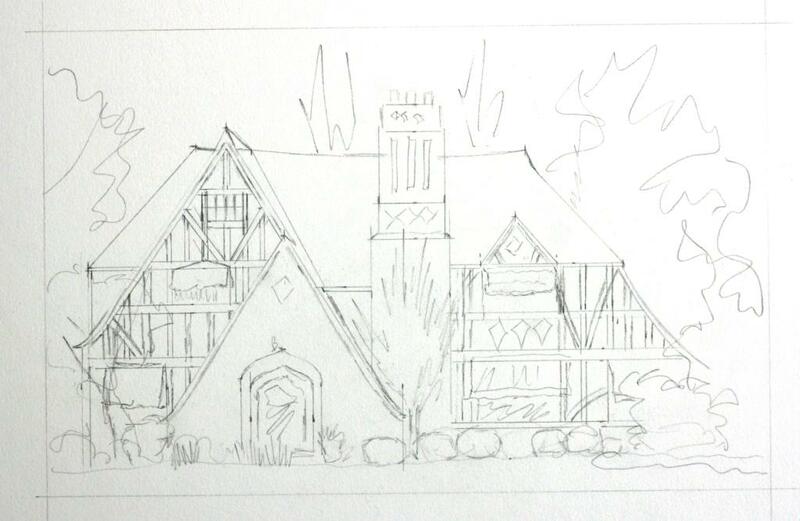 I did manage to finish the inking on this little house today even though my little finger is swollen and achy. At least there wasn’t much left to do. It’s amazing how much I use all of the fingers on my hand. I could barely draw the straight lines for the siding because I was holding my pinkie out and not bending it. The siding looks a bit wonky to me but it will have to do. Watercolor will be up in the next couple of days. The house is just a blah sort of green with black shutters and white trim. I am going to look at my other photos and make it more colorful. 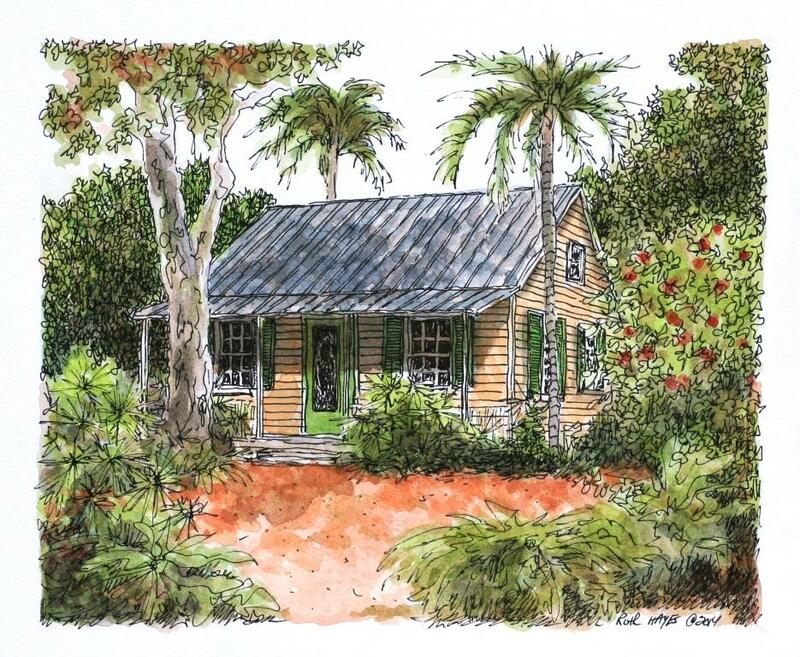 It may be a small house, but it can have big Key West colors. Now back to icing my finger. I’ve been a bit lax on posting the last 2 weeks, but I have a good excuse. It is black raspberry season!! If you have been looking at my blog for the last few years, you know that studio time lessens somewhat when the berries come in. Nothing gets between me and my berries. I have picked about three gallons so far, and if you know how small black raspberries are, you know that is a lot of picking. Almost done though. Next up will be the blackberries, but not for a few weeks. I enjoyed doing the two little art studios last month and thought I’d like to do something else in the same vein. 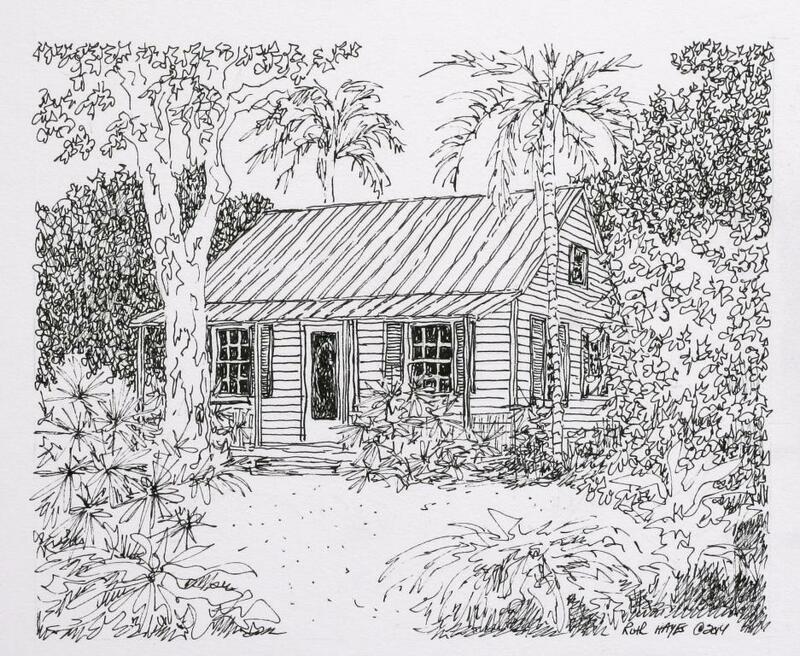 I found a small Key West cottage in my pictures and thought it would be a good choice. I penciled it up today. I plan to do it in the pen and ink and the watercolors. It has been fun playing with the watercolors on a small scale. If I disappear again for a short period near the end of the month, just think about me, out in the fields picking blackberries. I am hoping for 3-5 gallons worth. All of the berries seem to have liked our long cold weather and are producing well.